WASHINGTON, October 1, 2018 – It’s the month before the midterm elections and one of the nation’s leading disability organizations has a wake-up call for candidates. “Fully three-quarters of likely voters either have a disability themselves or have a family member or a close friend with disabilities,” said former U.S. Representative and Dallas Mayor Steve Bartlett. Bartlett is the chairman of RespectAbility, a Washington-based nonpartisan nonprofit that fights stigmas and advances opportunities so people with disabilities can participate in all aspects of community. Our survey shows that 74 percent of likely voters are touched by disabilities. Our nation was founded on the principle that anyone who works hard should be able to get ahead in life. These folks deserve an equal opportunity to earn an income and achieve independence just like anyone else. 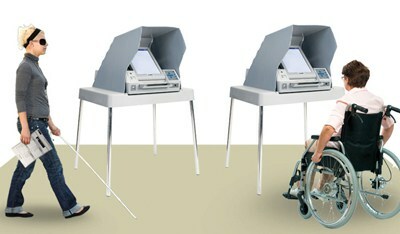 Candidates for office ignore the disability community at their peril. “Of particular note from the survey is that while there are certain issues historically on which people with disabilities feel more strongly than Americans without disabilities, such as healthcare and employment opportunities, they track in a similar way to Americans overall when it comes to their political identity,” noted Meagan Buren, pollster for RespectAbility. A recent poll of 1,000 likely voters shows that fully 34 percent are grouped as swing voters, 36 percent as Democrat and 29 percent as Republican. More than half of Americans with disabilities have reached out to their elected officials or attended a political rally in the recent past versus 39 percent of Americans without a disability or any disability connection. Nearly three-quarters of people with disabilities watch, read or listen to the news five to seven times a week. “This is a politically active, swing vote demographic and candidates should take note of important issues they care about, especially around employment opportunities,” Buren added. “The disability community is the only minority anyone can join at any time due to accident, illness or injury,” Bartlett said. “According to data compiled by the Workplace Initiative, fully 20 percent of workers will experience a disability lasting a year or more during their professional lives, a rate that accelerates as workers age.” Nearly a third of U.S. families have at least one member with a disability and 10 percent have at least one child with a disability, he added. Throughout the month of October, RespectAbility and other disability groups will be celebrating the accomplishments of employees with disabilities and inclusive employers such as Coca-Cola, JPMorgan Chase, EY, UPS, IBM, Walgreens and Starbucks. Likewise, RespectAbility also is working with state governors on proclamations and events that showcase cost-effective programs impacting people with disabilities at the state level. Find more about their work on their website at https://www.respectability.org/.